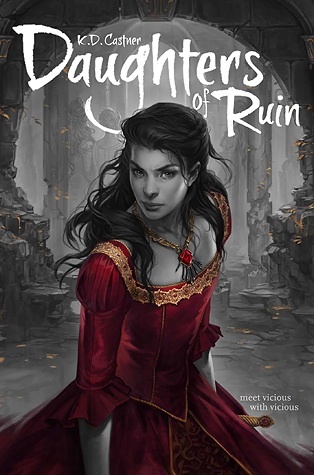 Daughters of Ruin – Don’t judge this one by its cover, or its summary. Really, you should just read my review. This was a pretty fierce read. Ignore the cover and the summary because they both fail to really impart how vicious and bloodthirsty this book is. I admit it sounds sweet – four future queens raised to be sisters and guardians of peace. However, something went seriously wrong with this plan because each new scene pits these girls against each other in everything from hand-to-hand combat to the subtle art of mean girling. Rhea, Cadis, Suki, and Iren have lived together since they were children. They are called sisters. They are not. They are called equals. They are not. They are princesses…and they are enemies. Not long ago, a brutal war ravaged their kingdoms, and Rhea’s father was the victor. As a gesture of peace, King Declan brought the daughters of his rivals to live under his protection—and his ever-watchful eye. For ten years the girls have trained together as diplomats and warriors, raised to accept their thrones and unite their kingdoms in peace. But there is rarely peace among sisters. Sheltered Rhea was raised to rule everyone—including her “sisters”—but she’s cracking under pressure. The charismatic Cadis is desperately trying to redeem her people from their actions during the war. Suki guards deep family secrets that isolate her, and quiet Iren’s meekness is not what it seems. All plans for peace are shattered when the palace is attacked. As their intended futures lie in ashes, Rhea, Cadis, Suki, and Iren must decide where their loyalties lie: to their nations, or to each other. I think my high school readers are going to be wildly engaged by this book. It isn’t just the fact that the plot is full of action packed fight scenes. This book also manages to concisely convey the universal emotions and doubts inherent in coming of age. Add in the surprising twists of plot and unexpected reversal of characters, and you have a story that is guaranteed to captivate a wide range of readers. I’ll admit that I wasn’t sold on a book that involved four narrative voices, and I did have a preference for Rhea, the initial narrative voice. However, I am now convinced that this was a pretty smart move on the part of the author because it acts as a device that rotates the story so readers get a 360′ view of the plot, which maximizes the depth of the twists and betrayals. I know I’m gushing here, and I’m not sure that this book is gush-worthy for a few simple reasons. The narrative sometimes felt disjointed. There are clearly chapters that are styled with purpose and intent to be disjointed, but several times outside of those chapters, I found myself having to retread passages that just weren’t smooth enough to be clear. I also didn’t really connect emotionally with these characters. Two characters were, I believe, distant by design. However, I still struggled to embrace the two characters I felt I was suppose to connect with, which I think is the fallout of having four narrative voices. I don’t think these issues interfered with my overall enjoyment of this book, and I would recommend it to my high school students, particularly those who have enjoyed books like Victoria Aveyard’s Red Queen or Sarah J. Maas’ Throne of Glass. The characters are distinct, crafty, and battle hardened lady warriors, and I found them quite intriguing. I can’t wait to get a copy or three in my classroom library. Language and situations are appropriate for high school readers, but I think a lot of adult readers of YA will enjoy this just as much.